I took this photo of Slash from Guns'N'Roses in the mid-90s. He played a solo show at a music expo in London's Docklands, showcasing some of the guitar expertise that defined the sound of Guns'N'Roses. He later went on to have success with Slash's Snakepit and Velvet Revolver, and wrote music for the guitar simulation game Guitar Hero. 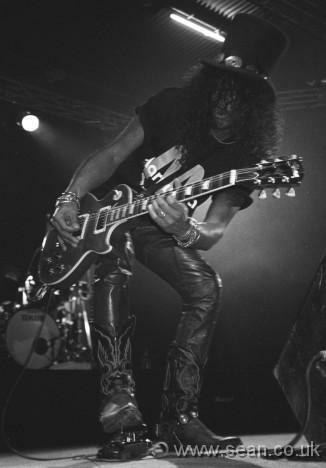 I particularly like his pose in this concert photo, and the fact that you know it's Slash even though you can't see his face. He has such an iconic look that you can tell who it is even when you can't see his features. The flip side of that is that he can probably travel incognito as Saul Hudson by just taking off his hat and putting his hair into a ponytail. I took this photograph on black and white film using a Canon T70 camera and then scanned the negative.